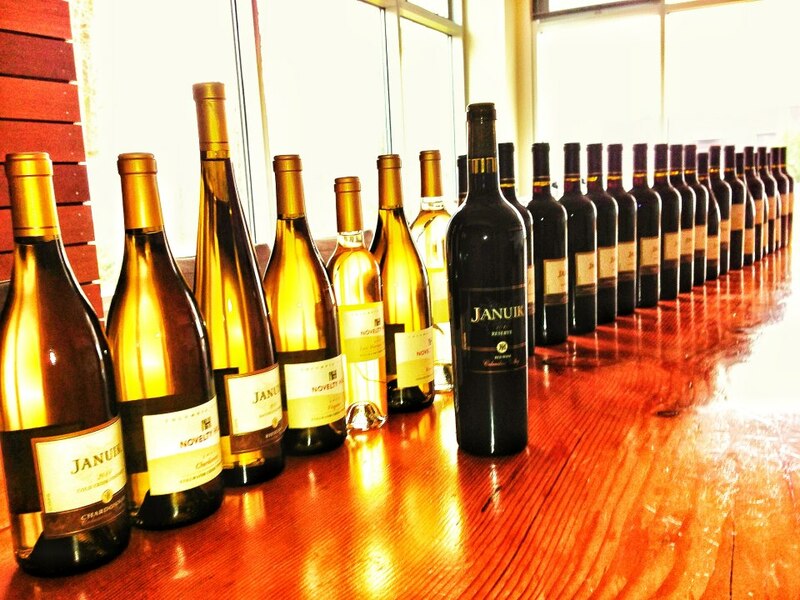 Tasting through the lineup of Januik Winery and Novelty Hill 2011 whites and 2010 reds, it’s impossible not to be captivated both by their breadth and by their quality. 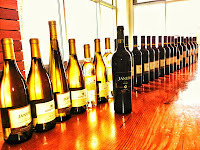 Winemaker Mike Januik produced an astonishing 28 different wines from each of these vintages. In what was, for many, a challenging two years, Januik not only continued to produce the high quality wines he is so well known for - he excelled. “2010 certainly wasn’t a year you want to follow set rules,” Januik said. With over 30 years making wine in Washington, he had reason to be less anxious than most for the cool 2010 and 2011 growing seasons having seen similar conditions before. Still, there were some reasons for concern. He says of his Cold Creek Chardonnay, “I’ve made this wine since 1990. I was afraid I wasn’t going to be able to make it in 2011.” The rows that Januik typically works with were adversely affected by the freeze of 2010. However, Januik’s former employer, Chateau Ste. Michelle, let him pick other rows within the block. “They’ve been great about that,” he says. Within the Januik lineup there is not just breadth and quality though, there is also value. The Columbia Valley Merlots and Cabernet Sauvignons from both Januik and Novelty Hill are absurdly good for the price. For insiders, there are, or course, the vineyard-designated wines which is where the winery truly sings. All of the 2010 reds are also notable for their dazzling texture. Read previous posts about Januik and Novelty Hill here. Picture above courtesy of Januik Winery and Novelty Hill. Note: Wines listed as ‘NA (Not Rated)’ will subsequently be reviewed in Wine Enthusiast once the wines are submitted (see explanation here). (Good/Excellent) An aromatically appealing wine with cream, pear, melon, and spice. The palate is medium-plus bodied with abundant spice and melon flavors. 100% Roussanne. Barrel fermented and aged 7 months in neutral French oak. 13.5% alcohol. (Good) An aromatic Viognier with ripe peaches, vanilla, and cream. The palate is medium-plus bodied with abundant stone fruit and spice flavors. 80% Viognier, 20% Roussanne. Barrel fermented and aged sur lie for seven months. 13.5% alcohol. (Excellent) Lightly aromatic with straw, spice, and light tropical fruit. The palate is subdued, creamy, and drawn out with a lingering finish. A compelling wine; few do Chardonnay better than Mike Januik. 100% Chardonnay. Barrel fermented in French oak (50% new). 13.5% alcohol. 1,250 cases produced. (Excellent) An aromatic wine full of orange peel, fig, honey, and marmalade. The palate is incredibly rich and concentrated with a pronounced finish. 100% Semillon. Barrel fermented and aged seven months in French oak. 11.5% alcohol. 23% Residual Sugar. 235 cases produced. (Good/Excellent) A moderately aromatic wine with bright raspberries and cocoa powder. The palate is loaded with chocolate and red fruit flavors letting up just a touch toward the finish. 95% Merlot, 3% Cabernet Sauvignon, and 2% Cabernet Franc. 14.4% alcohol. 1,250 cases produced. (Excellent) Considerably less aromatic than the Columbia Valley offering from the same vintage, this wine is locked up right now with cocoa powder and red fruit. The palate is tightly wound with cherry flavors and velvety tannins. Needs time to open up but a superb value for this level of quality. (Excellent) Dark in color with a purple rim. Moderately aromatic with chocolate, spice, and cherry. The palate is full of cherry flavors with more tannic structure than is frequently found on this variety. 94% Malbec, 4% Cabernet Sauvignon, and 2% Merlot. Aged 22 months in French (70%) and American oak (50% new). 14.4% alcohol. 401 cases produced. (Excellent) Lightly aromatic with cherry, spice box, herbal notes, butterscotch, and a touch of cocoa. The palate has rich, drawn out chocolate and cherry flavors and a lingering finish. An incredibly impressive, exciting wine that offers superb value. (Excellent/Exceptional) Very locked up at present but with coaxing it reveals cherry, chocolate, toffee, and tea leaves. The palate is deliciously rich with chocolate and cherry flavors and velvety tannins. (Good/Excellent) An aromatic wine with floral notes, candied raspberries, and vanilla. A rich, creamy mouthfeel coats the palate with red fruit and barrel flavors. 100% Grenache. Aged 22 months in French oak (50% new). 14.4% alcohol. 317 cases produced. (Good/Excellent) Very aromatically quiet at present, it opens to reveal char, cherry, and oak spices. The palate has a voluptuous, textured feel with rich fruit flavors. Give one year. (Excellent/Exceptional) A dark, glass staining wine. Aromatically locked up with chocolate, blackberry, and a touch of raspberry and white pepper. The palate is absolutely delicious with rich, hedonistic cherry and chocolate flavors. (Excellent) An aromatically appealing wine with cranberry, herbal notes, a touch of raspberry, and oak spices. The palate has an outrageously compelling mouthfeel (it’s written three straight times on my notes) with a lingering sense of freshness. 90% Sangiovese, 10% Cabernet Sauvignon. Aged 22 months in French oak (50% new). 14.4% alcohol. 240 cases produced. (Excellent/Exceptional) A moderately aromatic wine that draws you into the glass with pear, candy corn, and spice. The palate is creamy and full with drawn out fruit flavors. A tremendous Chardonnay. (Good/Excellent) An aromatic wine with lime zest, jasmine, and citrus. The palate is off-dry, full of stone fruit and citrus flavors with a long finish. (Good/Excellent) An aromatic red full of toasty spices, chocolate, herbal notes, and red and black fruit. The palate is full of silky oak flavors and chalky tannins. Shows a little heat. Still, a lot of wine for the money. (Excellent) Leaps up with raspberries and chocolate accented by toasty spices. The palate has tart fruit flavors and a lingering sense of freshness. Klipsun, Ciel du Cheval, and Weinbau vineyards. (Excellent/Exceptional) An aromatic wine with char, toasty spices, and dark raspberries. The palate is still wound up tightly shows incredible restraint and intensity with beautifully integrated tannins. A gorgeous wine that will last a lifetime. NA (Not Rated) An aromatic, barrel forward wine with sweet spice, cocoa, and spicebox. The palate is soft and restrained with drawn out chocolate and cherry flavors. Note: Review will subsequently appear in Wine Enthusiast after wine is submitted. NA (Not Rated) Leaps up with plum, wood spice, and light chocolate. The palate is tart and expansive soft fruit flavors. Note: Review will subsequently appear in Wine Enthusiast after wine is submitted. (Excellent) Lightly aromatic with pencil shavings, spice, dark cherry, and chocolate. The palate is full of chocolate and cherry flavors with drawn out tannins. Ciel du Cheval, Champoux, Weinbau, and Lady Hawk vineyards. NA (Not Rated) An aromatically appealing wine with chocolate, spice, cherry, incense, and floral notes. The palate is rich but restrained with impeccably balanced chocolate and cherry flavors and a compelling mouthfeel. Note: Review will subsequently appear in Wine Enthusiast after wine is submitted. NA (Not Rated) Dark cherries rise up out of the glass along with incense and milk chocolate on this brooding, distinctive wine. The palate has restrained cherry flavors, displaying both elegance and power. Needs time but will be one to wait for. Note: Review will subsequently appear in Wine Enthusiast after wine is submitted. (Excellent/Exceptional) Aromatically brooding with mineral notes and spice in front of a layer of cherries. The palate is broad and expansive with chocolate and cherry flavors. An incredibly impressive wine that will only improve with additional time in the bottle. (Exceptional) Dark in color. Still in its shell, this is an aromatically brooding wine with cherry and floral notes. The palate is full of cherry and chocolate flavors with beautifully integrated tannins and vibrant acidity. Give this one time but it’s a beauty. (Excellent) Dark in color with purple at the rim. A moderately aromatic wine with dark berries, mesquite, chocolate, mineral notes, and a whiff of pepper. The palate has soft fruit flavors and gauzy tannins, showing impeccable restraint. (Exceptional) Aromatically locked up right now with spice box, floral notes, cocoa, cherry, and graphite. The palate is rich but restrained with layered fruit flavors and exceptionally well-integrated tannins. A flat out gorgeous wine. Give two-plus years or decant. Thanks for taking the time to taste through this extensive line-up, Sean. As always, your thoughtful tasting notes are appreciated.